We at MS Machinery a leading manufacturer ofRoller Cutting for blister machine also Garment Printing, Fusing, Heat press, and other textile printing machine. 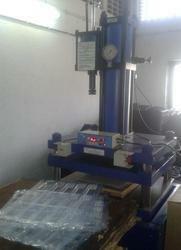 Blister cutting machines are used for cutting the formed sheets into individual blister. Cutting process can be done either before sealing or after filling and sealing the blister. The cutting is done using special type cutting dies, which are made as required. Models which are available are rotary cutting machine hydro pneumatic cutting machine etc. Looking for Roller Cutting ?